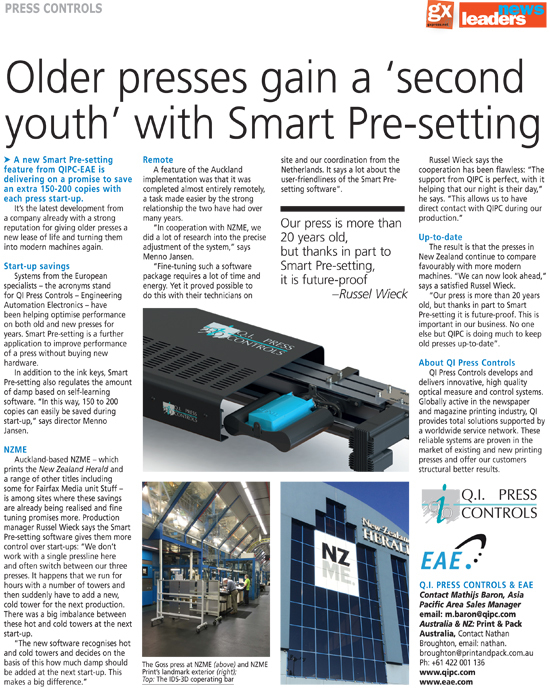 A new Smart Pre-setting feature from QIPC-EAE is delivering on a promise to save an extra 150-200 copies with each press start-up. It's the latest development from a company already with a strong reputation for giving older presses a new lease of life and turning them into modern machines again. Systems from the European specialists - the acronyms stand for QI Press Controls - Engineering Automation Electronics - have been helping optimise performance on both old and new presses for years. Smart Pre-setting is a further application to improve performance of a press without buying new hardware. In addition to the ink keys, Smart Pre-setting also regulates the amount of damp based on self-learning software. "In this way, 150 to 200 copies can easily be saved during start-up," says director Menno Jansen. Auckland-based NZME - which prints the New Zealand Herald and a range of other titles including some for Fairfax Media unit Stuff - is among sites where these savings are already being realised and fine tuning promises more. Production manager Russel Wieck says the Smart Pre-setting software gives them more control over start-ups: "We don't work with a single pressline here and often switch between our three presses. It happens that we run for hours with a number of towers and then suddenly have to add a new, cold tower for the next production. There was a big imbalance between these hot and cold towers at the next start-up. "The new software recognises hot and cold towers and decides on the basis of this how much damp should be added at the next start-up. This makes a big difference." A feature of the Auckland implementation was that it was completed almost entirely remotely, a task made easier by the strong relationship the two have had over many years. "In cooperation with NZME, we did a lot of research into the precise adjustment of the system," says Menno Jansen. "Fine-tuning such a software package requires a lot of time and energy. Yet it proved possible to do this with their technicians on site and our coordination from the Netherlands. It says a lot about the user-friendliness of the Smart Pre-setting software". Russel Wieck says the cooperation has been flawless: "The support from QIPC is perfect, with it helping that our night is their day," he says. "This allows us to have direct contact with QIPC during our production." The result is that the presses in New Zealand continue to compare favourably with more modern machines. "We can now look ahead," says a satisfied Russel Wieck. "Our press is more than 20 years old, but thanks in part to Smart Pre-setting it is future-proof. This is important in our business. No one else but QIPC is doing much to keep old presses up-to-date". QI Press Controls develops and delivers innovative, high quality optical measure and control systems. Globally active in the newspaper and magazine printing industry, QI provides total solutions supported by a worldwide service network. These reliable systems are proven in the market of existing and new printing presses and offer our customers structural better results.